…because his name is on the box. Yesterday, my group and I got together to celebrate the belated birthday of one of our own. He’s a huge R. A. Salvatore fan so we got him the new Legend of Drizzt board game. I had purchased the Wrath of Ashardalon game some time ago and it had been received well, so I figured this would be an excellent gift. Wrath of Ashardalon is a fun game and makes for a quick D&D-esque experience and is easy to play even after a drinking way too much beer from watching football before sitting down to play a game. 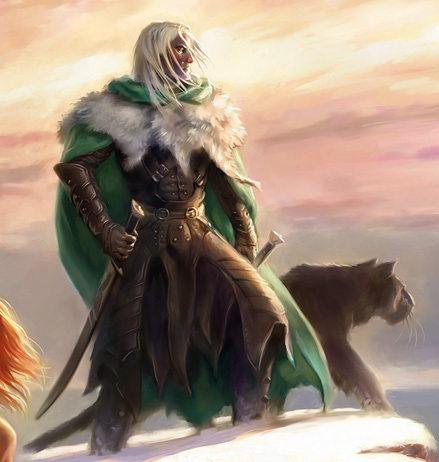 Why wouldn’t Drizzt’s own boardgame be any different? Indeed, it is pretty much the same set-up as Wrath of Ashardalon. And like Wrath of Ashardalon, it is a quick game for bored gamers who can’t decide on what type of campaign to get involved in or what character to make once a campaign has been decided upon. The game designers incorporated some new elements in the Legend of Drizzt that separates the dungeon from the Ashardalon dungeon. I am glad for this because I was afraid that this would be an exact duplicate of Wrath of Ashardalon. There are, however, plenty of choices so playing Drizzt, Wulfgar, and the team can be different each time you approach the game. I got the impression that Drizzt is a little over-powered. But I guess that should be expected as his name is on the box. We all (generally) enjoyed the game, but not enough to play for too long. I think its fun, but it is not really a substitute for role-playing with your gaming group. A nice distraction, but that is all. But even the table top version of 4E is littered with too many components to it now (fortune cards, power cards, miniatures, etc.) that I am not exactly sure what I am playing anymore. It has just recently struck me: why, when I print out a character sheet from the character generator, do I get 8 pages of cards? I don’t want to play Magic, I want to play D&D. What is up with the all the cards? I digress. Legend of Drizzt was a fun game, even if some of the pieces seemed a little superfluous. This entry was posted on October 25, 2011 by Matthew T. Austin. It was filed under Product Discussions and reviews .